Although the Chevy Camaro might be an excellent tool for a drift competition, it’s not necessarily unique. That’s where custom shops come into play, like Level 7 Motorsports. For years, crazies far and wide have been using the Nissan S-Chassis cars for drifting, crashing, and racing. For those who like breaking the mold, the world standard Chevy LS1 engine is perfect – and they’re not exactly endangered. That’s exactly what Level 7 Motorsports did with this 1997 240SX. They retrofitted an LS1 with modified internals, higher compression, magnaflow center exhaust, larger fuel pump, aluminum driveshaft, a T56 transmission, brakes from a Nissan 350z, a giant ricer wing, a roll cage, and a slew of other parts. There’s just one major thing that separates GM Authority and this 240SX – the price. At a buy-it-now price on eBay of $25,800, you could buy a lot of other fast machines. But are they as special as this professionally built frankenricer? Shout in the comments. 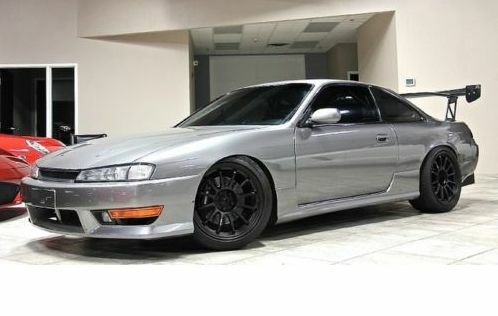 considering how light the S14 is, a LSx equiped version will dominate just about anything you can buy for 25 grand. so i say the price is more than fair assuming the work is all top notch.